Overshadowed by the news about Bobbi Kristina’s fake nurse is a shocking interview with the holistic doctor Bobby Brown retained in Bobbi Kristina’s final days to treat her with herbal medicine in a last ditch effort to keep her alive. The interview exposes some disturbing things that took place behind the scenes shortly before Bobbi Kristina died, and strongly suggests that there may be some truth behind those Bobbi Kristina death conspiracy rumors that are once again making the rounds on the Net. Harris gives a detailed account of his meeting with Bobby Brown, Pat Houston and hospice doctors after getting permission from Bobby Brown to personally examine Bobbi Kristina for himself because of the discrepancies he immediately saw in her physical condition from what he had been told. He describes how he relentlessly asked hospice doctors some very pointed questions about Bobbi Kristina’s treatment until they finally told Bobby Brown the truth about what was and was not being done for his daughter. , Bobby went ballistic after finding out what had really been going on. NOTE: Details covered in article mentioned above. Harris’ interview confirms information given several months ago by two people close to Bobbi Kristina, who had inside knowledge of her medical condition. Whitney Houston’s goddaughter, Brandi Burnside and Bobbi Kristina’s friend, Amber Melvisha were scoffed at when they made their comments – Brandi, in a TV interview, and Amber in a post on her Instagram account. However, it now appears that much of what they said was true. 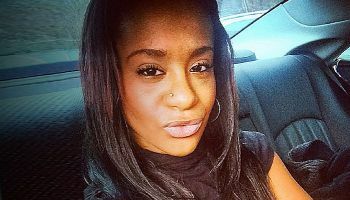 See Bobbi Kristina’s Family May Have Discontinued Life Support Too Soon In addition to Brandi’s and Amber’s comments, the original article also includes the interesting (and suspicious) chain of events which occurred after Pat Houston’s sudden appointment as co-guardian with Bobby Brown. After Pat Houston was appointed as co-guardian, there was very little Bobby Brown could do to save his daughter since the court order required both co-guardians to be in agreement regarding Bobbi Kristina’s medical care. This was highly unlikely to happen since Bobby and Pat had completely different agendas. Bobby Brown wanted to keep his daughter alive, but Pat Houston wanted to “pull the plug.” Pat Houston’s refusal to consent to further medical treatment, (holistic or otherwise) meant that Bobby Brown’s hands were tied. Nothing more could be done to save Bobbi Kristina's life. Her health continued to deteriorate to the point of no return, resulting in her death on July 26, 2015.